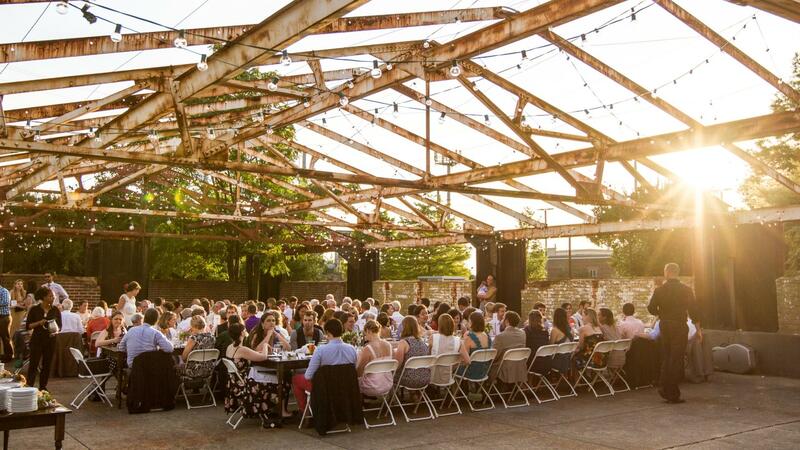 Rent Atlanta Contemporary Art Center | Corporate Events | Wedding Locations, Event Spaces and Party Venues. Atlanta Contemporary is a mission-driven contemporary art center well-suited to host a wide range of events including: wedding ceremonies and receptions, private parties, and corporate meetings. We look forward to working with you! Atlanta Contemporary is a mission-driven contemporary art center well-suited to host a wide range of events including: wedding ceremonies and receptions, private parties, and corporate meetings. Let the campus of Atlanta Contemporary become the perfect setting for your event - the former industrial warehouse includes an urban pavilion, light-filled Lobby and Lecture Hall (ideal for an indoor cocktail reception) with your guests being mere steps away from the galleries and special exhibitions. Built in the 1920s, our campus features a 30,000 square-foot former industrial warehouse with spacious and flexible event spaces and plenty of convenient parking. An urban pavilion, light-filled lobby, and lecture hall greet guests, who are mere steps away from our galleries and special exhibitions—an artful complement to your event. Atlanta Contemporary holds the on-premise liquor license and a beverage package must be purchased in order for you and your guests to partake of alcohol during the event. Bar packages start at a per person consumption fee. Please let us know if you would like to learn more about what we offer. Atlanta Contemporary does not make its facilities available for events such as press conferences, fundraisers or benefits, fashion shows or political charity events. Merchandising, or promotional events are also not permitted. Corporate events, private events, weddings, and film shoots (including engagement photos) require a contract and a fee.